Posted by Zach Brooks at 4:30 pm, April 3rd, 2009 under Harry, Midtown Links. That’s the biggest pickle I’ve ever seen on a baby. Is this Midtown Lunch or Cute Overload? He looks totally pissed off, like he is going to store this humiliation for later use when he is a teenager. Hah, I think I spotted you and the pramster the other day when you were walking west on 48th around lunch. I didn’t see anything posted on Gawker though. Zach, your photography skillz have now surpassed Daniel’s. Catching Harry mid street meat excrete is a marvel to behold. ML: on the cutting edge of the “green movement”. Are you sure your baby didn’t escape from the set of “Mars Attacks?” Look at that noggin! Nirvana (same owners as Darbar Grill), on 39th and Lex also has the free appetizer deal. Yikes! baby and a pickle on the baby? That is a dangerous picture…..
Harry is looking at you with no-no in his eyes. Awesomeness! I love the Harry pics! Keep them coming! FAVORITE PICTURE OF THE DAY! And I’m a photo editor so I see a lot of pictures. Keep those great baby pix coming, Zach! Harry rocks! Harry looks overwhelmed with all the food you laid on him. 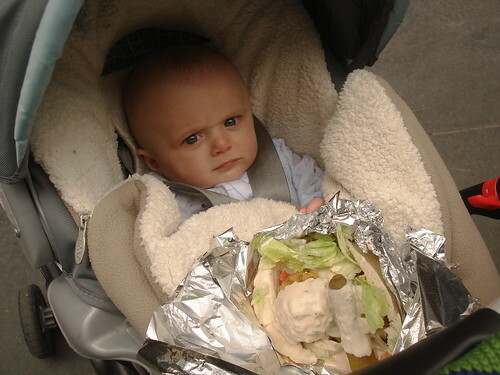 hehehe…i’m glad to know the baby’s lap can double as a lunch try. btw…our baby boy has the same carseat/travel system.